5 February, 2019 marks 430 years since the first establishment of the Patriarchy in Russia. At present, patriarchy seems to us to be an inviolable, almost intrinsic or original form of church governance, though over of 1000-year of Russian church history, little more than 200 years are characterized by patriarchy and patriarchs. – Fr Georgy, over the 430 years since the first establishment of Patriarchy in Russia, has our understanding of patriarchy as a means of church governance or our understanding of the service of a patriarch changed in any way? – Of course it has. Patriarchy is not an intrinsic form of governance, nor has it always been manifest in the church; our understanding of its essence has also changed over time. The patriarchy that originated in the church of the 5th and 6th centuries was a consequence of the development of principles of church structure which were characteristic of the Constantinian Era,1 all of which presupposed the support of an emperor and the inclusion of the church in the administrative structure of the empire. It would have been impossible for patriarchy not to emerge at that time, when the church was increasingly coming to reflect the structure of a monarchical state, in which undivided authority was of primary value. At that time, people even came to view the coming of Christ as a manifestation of unity of faith and spiritual life – the faith and spirit which would unite all peoples and races from every province and country. The person of the patriarch was understood precisely in this context – in the context of a “symphony” of relations between church and state, and was in some sense an attribute of the orthodox Eastern Roman, Byzantine Empire. In the Western Roman Empire, the Pope occupied an analogous position. The state looked upon the church as a fundamental part of itself, organizing and fastening together everything within the empire. And the church began to look upon the emperor as if he wer a “bishop from without” – from the secular world. The church and the state began to recognize each other in this way, and this recognition was appropriate to a “territorial-parish” 2, or more accurately, a “territorial-diocesan” 3 church structure – a particular ecclesiology that differed from other ecclesiologies – or understandings of the church – existing in the period before the ascendance of Constantine the Great. Particularly I have in mind Eucharistic4 and Communal-Brotherhood5 ecclesiologies. Of course the patriarch was an important figure in this secular-spiritual vertical power structure, particularly because he represented the church before the emperor. Insofar as Rus accepted Christianity during the Constantinian Era, all of the traits of Byzantine patriarchy relate directly to our Russian patriarchs up until the time of Peter the Great. Under the charm of Protestantism, Peter the Great abolished the patriarchate in order to decrease the influence of the church, and our “synodal period” began at this point. The patriarchy was only reinstated in 1917, almost simultaneously with the event of the Bolshevik Revolution. – What is the difference, at base, between the patriarchy of the pre-synodal period, as compared with the later manifestation of patriarchy in Russia during the Soviet and post-Soviet periods? – I’ve already said a bit about how patriarchy was understood in the period between 1579 and 1700. And after the synodal period, our patriarchy was reinstated at practically the same time as the Bolshevik Revolution. In 1917, the Constantinian Era of church life comes to a close, and everything changes radically. The urge toward patriarchy in the period before the Russian Revolution was somehow justifiable and explicable in view of a desire to escape a situation of excessive influence on the part of the state and return to the previous norms of church life, as established in and maintained by the canons of the church. But after the Bolshevik Revolution of 1917-1918, the urgently posed question of selecting a patriarch reflects the supposition that the patriarch would be the figure who would stand up against all lawlessness, iconoclasm and the prevailing general mood of hatred toward God that contradicted everything to do with the church. If before the October Revolution it was possible to justify the idea of restoring the patriarchy, the whole idea became questional, thereafter. In addition, the majority of members of the council [of 1917-18] did not vote for the restoration of the patriarchate. As is well known, on the day the vote took place, there were only 220 people present at the council, which was fewer than half. In the end, only a quarter of the members of the council voted in favour of restoration. Of course, the figure of the patriarch turned out to be very vulnerable in an era of godless authority. Through a single person, it was much easier to manipulate the church as a whole, and having “neutralized” the patriarch, it was possible to paralyze the entire management of the church. Patriarch Tikhon (Bellavin) endeavoured to battle this state of affairs. He wanted to increase the autonomy of separate diocese and grant them significant independence. Of course he wanted to feel that he was a patriarch in the same sense as the patriarchs before Peter the Great, but he found himself caught in the “red machine”, and though not immediately, he was eventually forced into considerable compromises with the anti-church authorities. Nevertheless, he bore his service in that worst-of-all-eras as worthily as he was able, and for his merits he was canonized and is now venerated in our church. Post-synodal patriarchy began in earnest after Patriarch Tikhon and after the inter-patriarchal period which lasted from 1925 until 1943, when at a certain point it became useful to the authorities – and we are speaking of Stalinist, communist, godless authority in particular – to cast its lots in favour of this particular form of church structure. Under the Soviet patriarchy, the church was at its “least independent”, and least able to exist, act or speak freely. This type of patriarchy, which continued until the end of Soviet authority in our country, already falls within the post-Constantinian Era [of church history]. It was time, at that point, to change our understanding of church structure, but no one acted decisively in this direction. The Patriarch became an absolute figure within the church, and in this sense only all the more crowned a rigid vertical authority that isn’t actually very helpful to the church. It is precisely this vertical power structure that has led the church into a clerical ecclesiology6, a clericalized management structure and to all of the church’s internal, self-referent life, which, is probably not really to anyone’s liking. Thus, at this point patriarchy is a fairly questionable institution, and perhaps we could even say anachronistic. In general, during the Soviet period and even after 1943, it would have been very useful for Christians to think about church de-centralization, though of course neither the church nor the state envisaged such a possibility or saw such a thing as desirable. And after the fall of Soviet authority, the church might have worked out its own effective structure without leaning back on either Constantinian or Soviet precedents. Unfortunately this didn’t happen, and for this reason the church has once again fallen under the enormous influence of the state, and herself has developed a clerical model of internal organization. It seems to me that this state of affairs should be alarming to us all: to clergy, to laypeople, and to all the people of Christ, in our own church and across the whole Orthodox world. – Why isn’t the question of church management being posed at this time? Is it only because of power that the people who currently run our church don’t wish to part with, or are we dealing with some sort of detachment from our own tradition and a one-sided understanding of how the church should be organized? The Council of 1917-1918 considered not only various forms of patriarchal and non-patriarchal organization, but proposed various models and types of organizational structure for the Russian church. They argued over what patriarchy itself should be or shouldn’t be, etc. At this point, we get the impression that the final model for the kingdom of heaven on earth has already been decided. Why did this happen? – The fact is that our hierarchs have neither the internal necessity nor the external possibility to change anything. Nor do they see any management alternative other than our present reality. This is the logical end of the Constantinian Era and the post-Constantinian period is a time in which the old forms of the past have not entirely left us, nor have any new forms successfully blazed a visible trail. The bishops who bear responsibility for the management of the church have a habit of looking rather pessimistically on the church as such – on the roles of laypeople, ordained ministers and monastics, etc. The bishops don’t seem to have enough faith in today’s church itself; they trust only themselves. And this stops them from seeing the church as a sobornal unity led by the Holy Spirit, rather than one or another – not always well-intentioned – pastor. If you listen closely to the sincere opinions of our bishops and priests on this matter, you’ll hear a sort of despair in what they have to say – a sort of grim sadness. After all, clericalism isn’t a management structure, but rather a belief that no one but the hierarchy can change anything for the better, and that therefore freedom shouldn’t be given to anyone, no matter who they are, because that would be dangerous. Though St. Paul clearly says: “where the Spirit of the Lord is, there is freedom” (2 Cor 3:17), this for some reason doesn’t relate to church organization or the relationships between believers. But if there isn’t freedom, there isn’t respect for the individual person, i.e. we don’t have faith in the human person. Christianity, however, is faith in both God and in man, so that some of the most important bases of our church life and being are under attack here. Thus, there is no other reasonable response than to feel great sorrow at what is going on. – One of the main arguments that was brought upon the occasion of Patriarch Tikhon’s election, and which is still used today, is that a patriarch is a guarantor of unity within the church. This is visible unity, which is connected with the figure of the patriarch…and the unity which is expressed in the words of the Creed “I believe in One, Holy and Apostolic Church…”…is this the same unity? Or is there a disparity between these two understandings of unity? – Of course there is a difference, and the difference is markedly pronounced. Christian unity is determined by “unity of the Spirit in the bond of peace” (Eph 4:3), by unity of faith, unity of life, and unity of love in a spirit of freedom and truth. When the church management is put forward as a guarantor of unity, nothing can come of this. Patriarch Tikhon couldn’t make it happen and no one can. And it is not just by chance that conflict situations of real schism and disintegration are arising within the church, both on the level of Orthodoxy as a whole and within our Russian church, which is the largest of the orthodox churches. The whole of the 20th century falls under the shadow of this disintegration, due to ideological processes, nationalist movements, and grievances between churches – first and foremost, for various political reasons. The Finnish, Polish, Czechoslovak, American and Canadian Orthodox Churches separated from the Russian church for such reasons…the Japanese Orthodox Church, autonomously and with great difficulties and losses, remains. The Ukraine is still holding fast at the moment, but as we can see, the future looks dubious, because the political environment is extremely unfavourable for the unity of the Russian church. Nationalist sentiment is building in all the churches, except perhaps the Russian church in the Russian Federation. All of this cuts against unity, and no patriarch figure could even preserve the external appearance of unity in such a situation, let alone guarantee actual unity. 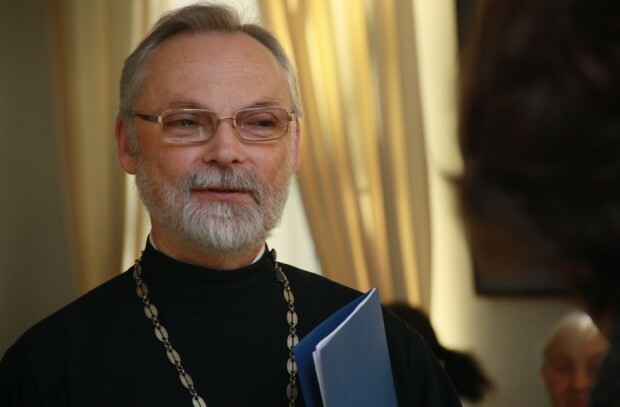 – This Ukrainian and Western-European crisis which is linked to the Patriarchate of Constantinople’s attempt to displace the Russian Orthodox within Europe – will this crisis in some way categorically affect our understanding of the role of hierarchy within the church and our understanding of the role of the Ecumenical Patriarch and of which of the orthodox churches is “greatest in honour” and worthy to sit at the head of all the orthodox, and represent orthodoxy before the rest of the world? – The current crisis affects and will continue to affect our understanding of church organization, though probably by means of warding people off the current status quo. Things shouldn’t be going the way the are: not in Ukraine, not in Istanbul, not in Moscow, etc. Everyone understands that these questions aren’t going to be decided in international meetings of all the orthodox or in councils. Such questions can’t be decided just on the strength of what hierarchs say; and, all the more, are they unsolvable using political or nationalist forces. Only within the life of the Church itself can these issues be resolved, and this requires an enlightened people who are able to come together in the bond of peace and in love. Church issues are resolved in the communal life of fellowship and brotherhood within the church, by revealing and renewing precisely these principles upon which the church has stood since the first day of its existence. And this is the real solution to our conundrum and our way out of the current crisis. The latest in a series of manipulations involving church hierarchy won’t resolve anything. Hierarchs may succeed in some sort of temporary patch-up effort, but even this is doubtful. Our hierarchy itself has entered a period of crisis, just as has all else formed during the Constantinian period of church history, including the canonical structure, our liturgical understanding of the mysteries/sacraments, and of dogmatic theology. No one can change this because we can’t turn back the clock. But we need to fortify new forms of ecclesial existence, change our priorities, remember and make sense of things anew – thinking about who and what is primary in the Church and what is secondary. We need to marshal and establish new relationships within the churches and between our orthodox churches. We even need to rethink the question of which is primary, the community or the church building. There is every reason to believe that in the future, the community of believers will again occupy the place of primacy. But then we’ll have to determine who the faithful are and what a “community” is; and only after that, will we determine the role of church services and the church building. Most likely, church buildings will be shunted into a secondary role within such a landscape – that is, we’ll speak about the building belonging to the community, the brotherhood, or the church group, rather than seeing the community, brotherhood or church group as an extension of the physical building. These are all questions of principle import, which demand a rebirth of faith in the Church itself, entailing a serious rebirth in both sobornost and life guided by a principle of personhood. And this is the basic issue for church life, at present, which is directly related to the question of the existence of the patriarchy as such within the Russian church, as within all the other orthodox churches. – This is the reason that I haven’t said anything about diocese or about territory. All these things are attributes of the Constantinian Era: all that too rigidly ties the church not to society but to the state, thereby putting the church in a position of excessive dependence. And it means that we have, somehow, to change this. The diocese is an administrative formation, absolutely non-ecclesial, not to mention the inter-diocesan structures such as metropolitanates, patriarchates, etc. – So all this is anachronistic? – Without question. The Church needs once again to become the totality and unity of all church communities and brotherhoods, gathered together in love, rather than rigidly bound together by territorial principals or one or another form of state governance and societal organization. Such a unity in love of independent communities is both possible and necessary, but of course it requires a great amount of work – first and foremost in terms of educating all the people of the church, so that every Christian clearly understands what community he is a member of, for whom he is responsible, what he does within the church, what he is striving for and what he is rejecting or turning away from in life. This is exactly what we do not have now, unfortunately, and which we absolutely need to have. It’s obvious that we can’t achieve such a thing overnight, or in a single year. There will need to be – and there will always be – intermediate forms, and we can expect the co-existence of forms which have been proven over the many centuries of church history and others, which will appear anew. – So the hierarchy should prepare the church for this transition into a new reality? – Yes. Both the hierarchy and all responsible people within the church should prepare her for rebirth and for a new organizational process, for new life under new conditions. 1 Constantinian Era – a period in church history which lasted from the mid 4th c. until the early 20th c., and is named for the first Christian emperor, Constantine the Great (approx.. 272-337), after whose time Christianity became the state religion of the Roman Empire. As the church grew in numbers and became more centralized and unified in terms of structure, the Constantinian Era came to be characterized by a blurriness in understanding relating to church membership and by a shift in emphasis in the direction of ritual and cult, which is uncharacteristic for Christianity. 2 Territorial-parish (diocesan) model – a model of church structure, in which the church gathering is tied to a particular geographical location (place). The Local church is made up of regional diocese, which are further broken down into regions or deaneries, in each of which there are parishes within the limits of the regional city and in rural villages. 3From the word “diocese” (from the Greek διοίκησις – management) – an urban and administrative unit in the Roman Empire. 4 Eucharistic Ecclesiology presupposes that the border of the church assembly is the same as the borders of the assembled people of God (laity – from the Greek word λαός – the people of God), thereby including all who regularly and responsibly participate in the main Eucharistic prayers of the church. The concept of Eucharistic ecclesiology was proposed in the 20th century by a leading Russian theologian and priest, Nikolay Afanasiev, who worked in emigration. 6 Clerical (clericalist) model – a model of church structure in which the central authority and power are in the hands of the church hierarchs, rather than all the people of the church, each of which, according to scripture (1 Peter 2:9) bears the dignity of king, priest and prophet.